Another day and another city tour. Today we were going to explore what Hué has to offer. Some of our friends had recommended that we drop by at this lovely city mainly for its abundance in old architecture. And there was no shortage of historic buildings. It's strange to think that this whole town was left to decay between 1975 and 1990 as the old buildings were regarded as politically incorrect - a reminder of the feudal Nguyen dynasty. However, in 1990 the local government realised the site's potential for tourism and declared the buildings national treasures. The city has not looked back since. Tourism has brought wealth to the city of Hué and the locals are keen to help tourists shed the odd ten thousand dong or two. As soon as we got off the bus yesterday, several hotel and motorcycle rental touts, cyclo drivers and mobile food sellers were already there to offer their assistance. We made a beeline for our intended hotel and left them all behind. Always read the small print was our lesson for today. We had booked a city tour but found out soon enough that for $6.50 US, we had basically booked a taxi service. None of the additional admission charges (and some of them were pricey by Vietnam standards) were included nor was there a guide to explain what we were about to look at. Our driver turned out to be an impatient scruffy man in his late forties with greasy black hair, who had a "What am I doing here?" kind of attitude. If he ever had career guidance advice as a youngster, he would not have been linked to a role in the tourism industry in a thousand years. Thien Mu Pagoda was our first stop. It is probably better known for its link in the anticommunist protests that took place in the 1960s. A famous picture of a monk, Thich Quang Duc (from this pagoda), burning himself to death in Saigon appeared in newspapers around the world - his self-immolation was to demonstrate his protest against President Ngo Dinh Diem's policies. On this occasion, the seven-storey octagonal tower was unfortunately covered in scaffolding but the temple itself was interesting to look at. The monks were very friendly and even guided us to the best spots to take good photos. The Vietnamese people that we have encountered so far all speak good English. Maybe the fact that we use a similar alphabet makes a big difference (compared, say, to Thailand). When we arrived at the Antiques Museum, the others in our group were dropped off and our driver took us to find an ATM. We had only brought enough money for lunch thinking that the admission costs were all covered. Fortunately, we found one ATM that worked after three attempts (as in, three ATMs). If time is short and you do not want to join an organised tour, there are three things that you simply cannot miss in Hué and these are: Thien Mu Pagoda, The Citadel and Tu Duc Tombs. Well, this is what we had been told. Entrance to the Old Citadel. The Old Citadel was constructed in the 1800s and was a fortress to Emperor Gia Long. The moated citadel encloses a 10km perimeter and is absolutely huge. Inside the complex are well-kept ruins of the palace grounds - the forbidden purple city (reserved solely for the use of the Emperor at the time), theatre halls, reading rooms, court ceremony halls, living quarters of other members of the royal family etc. You could easily spend half a day or more here but time was not on our side again. Everyone on our tour group arrived back at the meeting point a few minutes earlier, after our driver had told us that he'd only wait for one minute and if we weren't there by 12.21pm, we would be spending the rest of the day at The Citadel. Did I mention our driver was a cheery chappy?! Dong Ba Market is like any other market in Vietnam. Predominantly run by women vendors wearing conical hats, selling all manner of things - including conical hats. We didn't spend too long here which was just as well as we weren't planning on buying anything and didn't want to stay too long in one spot in case we caught the eye of an opportunist hawker. Not that they needed any encouragement. After lunch, we were dropped off at Nam Giao Temple for 15 minutes. The funny thing was that we didn't actually see any of it. We walked up to a circular platform to see a small pot with a couple of incense sticks poking out. We were a little confused - so where was the temple, was this space where it used to be? All became clear, as we were carted off in our minibus around the corner and down a considerable length of road ... the temple stood majestically in the distance and would have taken 20 minutes to walk to, from the point we were dropped off at. Ah, so there it was! Another quick stop at a church with an octagonal tower. Unlike the one at Thien Mu Pagoda, this was not covered in scaffolding. The church was nice to look at and again, the monks were friendly, trying to make conversation with everyone. These monks even spoke French, as well as English. Very impressive. 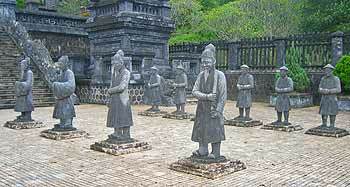 We paid the 55,000 dong entrance fee to set foot on the grounds of the Khai Dinh Tomb. A Canadian guy in our tour group made an interesting comment to the ticket inspector, having seen his Vietnamese partner paying 20,000 dong for the same privilege. Disgruntled by the dual pricing system, he made a remark that seemed lost on the inspector. "Why is there a dual pricing? This is supposed to be a Communist country." A good point I thought, and maybe the inspector had understood, but he put on the 'I don't know what this foreigner is saying' look, which he'd got down to a fine art. Nothing prepared us for what we were about to see at Khai Dinh Tomb. Built on a hilltop, it isn't what you'd expect to see of a tomb. This grandiose structure is more elaborate and has steps leading up to a platform, with lines of stone statues of horses, elephants and civil and military Mandarin soldiers. There are two sets facing each other like pieces on a chess board. More steps take you up to the main building, which is beautifully decorated with murals and mosaics, made from broken porcelain and glass. There is a golden statue of Emperor Khai Dinh (who ruled from 1916 to 1925) and his remains lie underneath this effigy. Tu Hieu Pagoda was teaming with more hawkers. These ones were even more persistent and incense sticks were constantly thrust in front of me, even after shaking my head several times already. This motion was kept up all the way until we reached the slippery steps to the pagoda and surprise surprise I still didn't wish to buy any of those pungent sticks that I so desperately wanted after the umpteenth time they were thrust in my face - not! Tu Duc tomb was our last stop of the day. Emperor Tu Duc (who reigned from 1848 to 1883) had designed the grand tomb himself and this complex was used before and after his death. 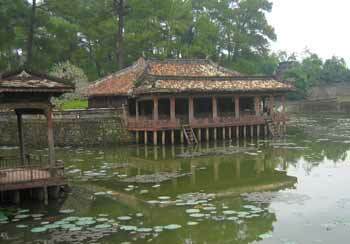 Inside these grounds are courtyards, Tinh Khiem Island, Hoa Khiem Temple (which was used as a palace before his death), tombs, a boat landing sheltered structure, a lake and a pavilion where the emperor would sit with his concubines while composing poetry. Apparently, he had 104 wives and countless concubines but never fathered any offspring. He did however adopt a son, Kien Phuc, who became his successor. Pavilion and lake at Tu Duc tombs. The view of the Chinese-styled pavilion, lake and bridge (connecting the pavilion to dry land) look like a picture postcard. Lotus pads fill the lake and look like something that Monet would have enjoyed painting. The grounds are lovely and green and a lot of thought had been put into designing the layout. Ho Chi Minh Museum was supposed to be our last stop for the day but as we pulled up alongside it, our driver told us that it was closed. I hadn't seen him so happy all day - maybe he'd thawed and was beginning to warm to us. Then again, maybe not! An hour later, we found ourselves on an overnight bus to Hanoi. This trip is all go. 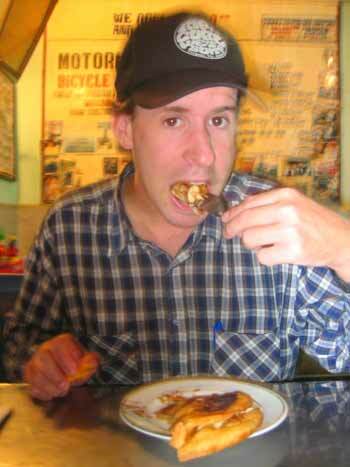 Preparing for the long journey ahead: Ian stuffs his face with a national dish - the banana pancake.